Oscar’s Lounge and Restaurant is located in the village of Calverton, Nottingham. 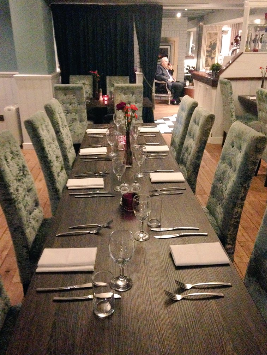 The recently refurbished venue boasts outstanding resources that allow diners to experience an exceptional dinner whilst also remaining value for money. 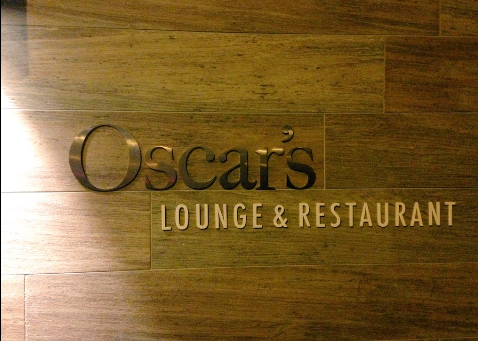 Upon entering Oscar’s I quickly noticed how friendly and relaxed the venue was, making it an ideal place for a quiet drink and a light snack. However, I was excited to try their newly designed menu in their formal dining area. The restaurant itself was spacious and well laid out with warm lighting and a light decor to create a luxurious ambience. A mix of traditional wood flooring and stone slabs along with chandelier lighting and well laid tables sets the tone for what was to be a pleasant dining experience. The chairs are also really comfortable and are set alongside modern and spacious well laid tables. The whole establishment has an air of sophistication about it, without being pretentious, with candles and flowers on each table adding to the stylish theme throughout. 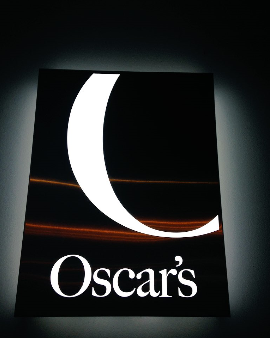 Oscar’s really seemed like a flexible venue that could meet the needs and preferences of a wide range of guests, from those who like more casual dining to those who would prefer a more restaurant like setting. 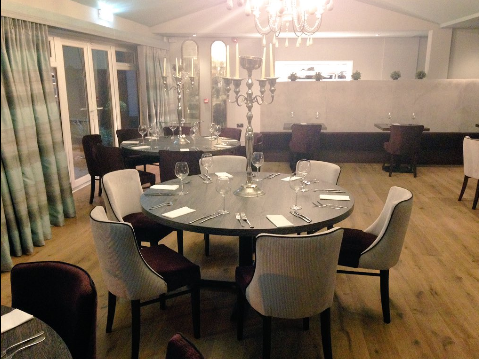 They also cater for group dinners and special celebrations, along with a contemporary function suite that you can hire for up to 150 guests which provides the ideal space for weddings and private parties. Despite being out of the city centre they are only a 15 minute drive from the centre of Nottingham and have ample parking on site. Alternatively they are also on the Calverton Connection bus route that runs from Nottingham city centre and takes around 40 minutes. The staff provided us with a warm welcome and were extremely attentive and informative about the venue and range of food and drinks on offer. After our coats were taken we were promptly sat in the bar area and ordered our drinks whilst we perused the extensive range of choices on their menu. Our drinks arrived quickly and our food orders were taken shortly after. Once our table was ready we were taken into the more formal dining area for our meal. They offer more casual items such as a burger and chips and steak and ale pie to more exquisite dishes such as lobster and crispy duck breast. Alongside this they also strive to offer a range of selected wines and craft beers that pair with various different dishes on their menu. Despite there being a good range of choice their emphasis is on the quality of the food at reasonable prices. 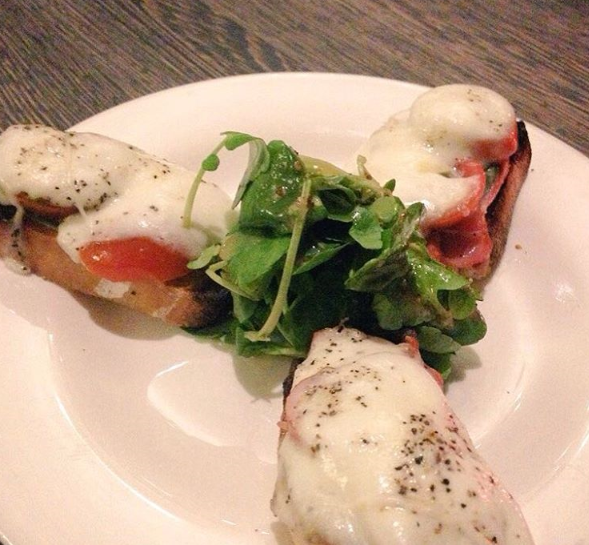 I decided to order the Parma ham bruschetta with mozzarella, rocket, tomato and basil for my starter, £2.95. 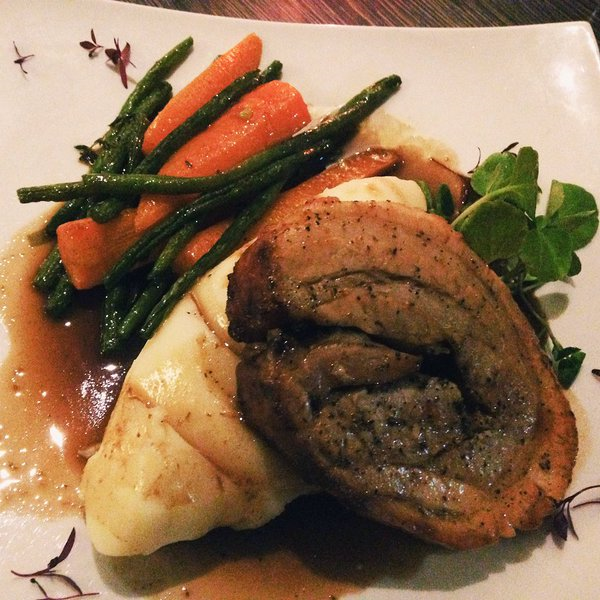 Slow roasted rolled belly pork for my main, £12.75 and black cherry cheesecake for my dessert, £4.95. My starter arrived fairly quickly and was well presented. The three slices of bruschetta were topped with plentiful amounts of Parma ham, mozzarella, tomato and basil and placed around a garnish of dressed rocket. The bruschetta itself was well toasted and remained nice and crisp throughout, despite being slightly overdone on one of the edges that was the only fault to this otherwise well executed classic starter. The mozzarella that topped the bruschetta was well melted, warm and creamy that went well with the rich, sweet and salty flavour of the Parma ham. The warm and fresh basil added a pungent and sweet aromatic aroma which worked excellently with the fresh and sweet cherry tomatoes. The dish was then finished with a drizzle of olive oil, a sprinkle of black pepper and a centre of rocket to add a little bit of peppery heat. Once I had finished the starter the staff were very attentive once again, asking how our starters were and asked if we needed any more drinks. My main course consisted of slow roasted rolled belly pork, smoked mash potato, confit thyme vegetables and red wine jus. The dish was well presented and you also got a good hearty portion size. The mash was the first thing that I tried as I was intrigued to see what the ‘smoky mash’ would taste like and how it would work with the other elements of the dish. The smoked mash made a nice change to the usual variations or just plain mash that is often served with such meals. The subtle yet flavourful smokiness of the mash matched well with the pork’s flavour and also the fuller bodied flavour of the red wine jus. In addition to this the mash was well prepared and a good smooth consistency with a few small lumps to add to the overall texture. The belly pork itself was quite tender for belly pork and as this cut contains more fat it was a good piece of flavourful meat. It was a good consistency and worked well with the other components of the meal. The beans had a slight crunch as did the carrots which had a slight bite to them and were infused with added flavour provided by the confit thyme. The rich flavour to the red wine jus moistens the dish and compliments the flavours of the belly pork. The dish was finished with a few leaves to dress and decorate the dish. Again the staff were very attentive and polite. For dessert I had the black cherry cheesecake that compromised of vanilla cream cheese on a butter biscuit base, infused with black cherry compote and finished with a black cherry glaze. The dessert was well presented on a slate slab and was colourfully and elegantly decorated with flowers, blueberries, raspberries and a strawberry. The black cherries that are mixed in with the cheesecake itself add extra sweetness and a range of textures to the light cheesecake that is based on a thin and crumbly buttery biscuit base. 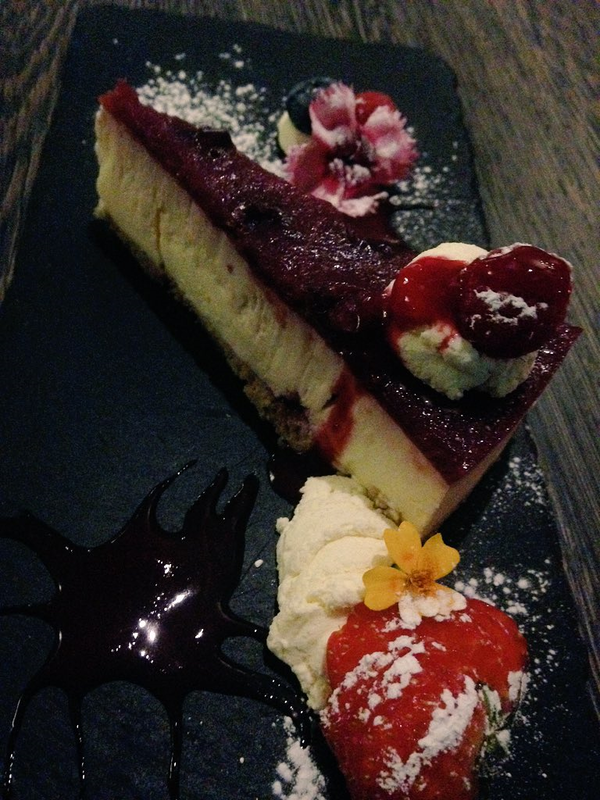 The cheesecake is then finished with a dollop of cream and a fresh raspberry. Overall I was very impressed with Oscar’s, not only the venue but also the extremely high standard of their hospitality and food. I am sure that once people sample their new menu and dining experience they will continue to go from strength to strength, particularly, as they provide a wide range of special offers throughout the week from fish and chip Mondays, an Indian night on Thursday, a ladies evening comprising of tapas and cocktails on Fridays and traditional roasts on Sundays, along with their myriad of choices on their main menu. Along with this they also offer an amazing venue for weddings, parties and various other special dinner functions. I will be sure to visit again soon to try more of their delights that are offer on their menu. Address: Oscar’s Lounge and Restaurant, Main Street, Calverton, Nottingham, NG14 6FN.